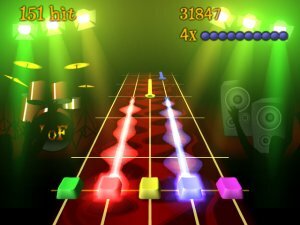 For months, I've heard and read about people playing Guitar Hero and it's sequels, and I've brushed it off as a low-grade version of Dance Dance Revolution -- it's the same game, but with less activity. Instead of getting exercise by jumping around on a foot-pad to hit the buttons, you push brightly colored squares on a child-sized guitar. Silly, right? My brother-in-law got the game for his Playstation 2, and the last few times I've visited him, I've played the game. And... I'm hooked. Every time I head over, all I can think about is playing new songs on that game. Ugh. Fortunately, I have the good sense to not buy a new game system on account of a single game. I don't own any of the late generation game consoles -- I'm still running old school with the Super Nintendo... which means I haven't purchased a game system since before 1995. However, I like the game enough to do something about it, and after doing a little hunting, I discovered that there's a game available for the computer called Frets On Fire... and instead of using a mini guitar, you use your keyboard. Yeah. That's right. Your keyboard. And the game even allows you to make your own fret-challenge from the songs you own. Fun. Oh man.. I played Guitar Hero for the first time on New Years Eve and fell in love it! I went out yesterday and bought it... Can't stop playing it. 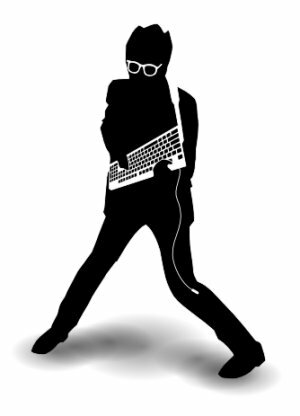 Awesome pic by the way of that guy jammin on his keyboard. that sounds cool, guitar hero is a fad that lasts only as long as you like the songs. It is a fun game. You are right though, never buy a system for the account of just of a couple of games, or even one. Robby - Some people like music enough to never get sick of songs, though. And at least on the Frets on Fire version, you can load songs into it and build your own fret-challenges, and download songs other people have made for the game.